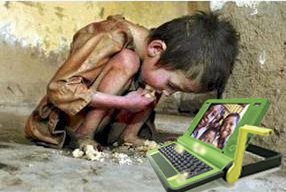 If this kind of $100 laptop is even possible, we should deploy it here in the U.S. first. Why are we neglecting our own people in an effort to improve the lot of people abroad? I'm all for helping out other countries, but let the foreign countries buy the technology at a low price from us if they can afford to do so. First, however, let's see if this initiative is even possible on a smaller scale before the UN or any other organization that we end up being the primary source of funding for starts throwing money at it. 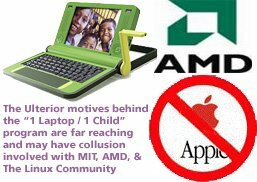 I agree that this is a scam designed to further the interests of the Linux community, AMD, and other companies that wil latch onto this money and use it ultimatel for their own purposes. I cannot believe that ANY organization will lightly throw out a figure of one BILLION dollars as a first shot. That is simply ludicrous. It makes no sense that OS X would be turned down for a unit like this. None. There is plenty of freeware available for OS X and certainly better support. Heck, they won't have to do MUCH support at all. This is clearly a case of someone having a hidden agenda. Its like public transportation turning down an established fleet dealer in favor of an experimental car.